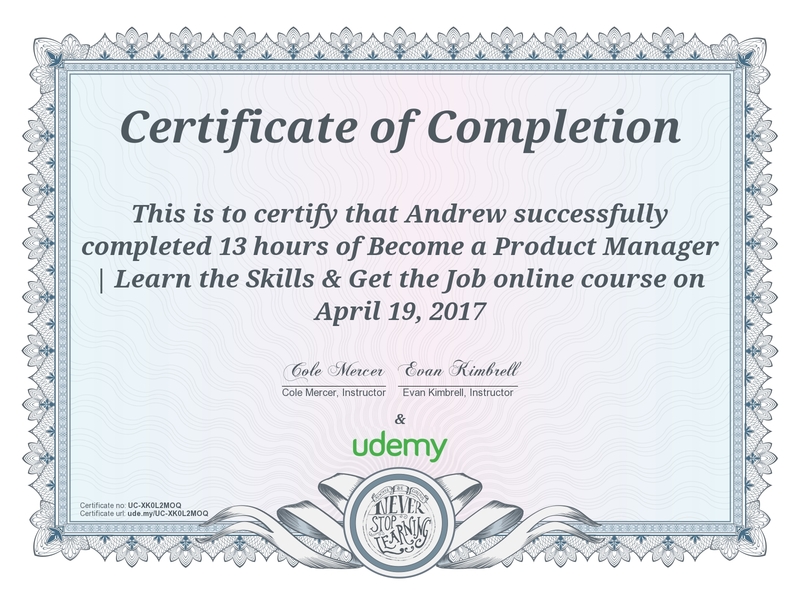 I recently finished the "Become a Product Manager | Learn the Skills & Get the job" course on Udemy. I had picked this up in December during one of Udemy's frequent $15 dollars. I was looking to take something non-technical that covers more of the "soft skills" I utilize in my job. I do a lot of software "product manager" work, without the title, at my job and was hoping to brush up on those skills. This course is billed as a 13 hour course, with activities and interviews with product managers. The course is taught by Cole Mercer (a Senior product manager at SoundCloud) and Evan Kimbrell (founder of Sprintkick). The course is packed with useful content, resources and interviews. I learned a lot and reinforced a lot of what I already knew. That information will be incredibly useful at work. That glowing review said, I had a hard time getting through the lessons. Despite the amount of useful information, I found the lessons to be...boring, at best. At worst, the instructors attempted to throw jokes in that just didn't work for this format. That type of distraction made it hard to stick with the lessons. Additionally, the quizzes that cropped up occasionally, were treated as a joke by the course creators. There were joke answers, there were joke explanations for answers and their were questions unrelated to the content but instead about the instructors. Finally, there are several points in the lessons that ask students to go the message board and provide feedback, do a quick activity, and interact with one another. I did a couple of these. I stopped doing them when I didn't receive any responses from either other students or the instructors. A closer look at the message board shows this is very common. I have to scroll back through a couple "load more" clicks on the message board to find any posts that even have a response. The interaction I was hoping for from the instructors just doesn't exist with this course. The content in this course is amazingly helpful. There are links to articles that I'll be able to use for years. The information in the lectures is also helpful, if you can get through the bland presentation of the material. The frequent, distracting, jokes and lack of interaction makes this course less stellar. Overall, I'd consider this a middle of the road course. The presentation is what drags down this information packed course.